USCIS began accepting new H-1B petitions on April 2, 2012. If approved, beneficiaries of these petitions may start working in H-1B status on or after October 1, 2012 – the first day of FY 2013 cap season. 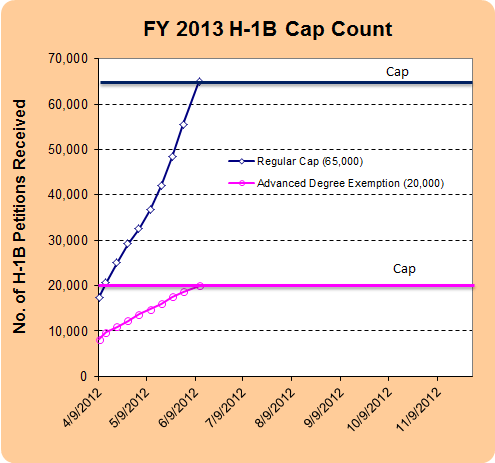 The following table includes every cap count released by USCIS. The table will be updated on a regular basis to show the pattern of this year’s H1B filing. The first count, conducted on April 9, 2012 is about three times more than last year’s. If this turns out to be a trend, H-1B visas could be exhausted much faster than last year, during which the regular cap was reached on November 22, 2011. On June 12, 2012 USCIS announced that they have received a sufficient number of petitions to reach the regular H-1B cap for FY 2013 as of June 11, 2012. 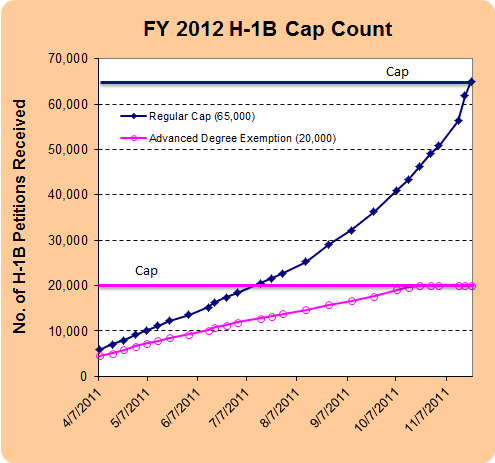 In addition, USCIS received more than 20,000 H-1B petitions against the advanced degree cap on June 7, 2012. USCIS will reject petitions subject to the FY-2013 cap for H-1B specialty occupation workers that are received after June 11, 2012. USCIS will continue to accept petitions not subject to the annual cap. This entry was posted in U.S. Immigration, Visa. Bookmark the permalink.